South Korea settled for silver in the men's table tennis team event at the 18th Asian Games on Tuesday. South Korea was blanked by China 3-0 in the men's table tennis team final match at Jakarta International Expo Hall B in Jakarta. 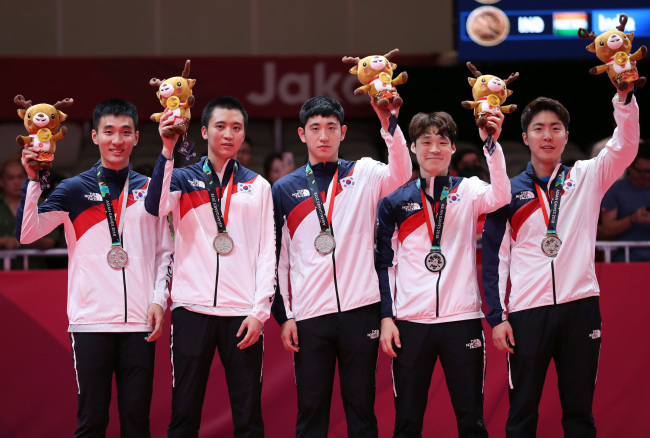 It was South Korea's seventh-straight silver at the Asian Games against the dominant Chinese squad, which now has 10 Asiad gold medals in men's team table tennis. The last time South Korea took gold in the men's table tennis team competition was at the 1990 Asian Games in Beijing. South Korea defeated India, while China beat Chinese Taipei to reach the final. Jeoung Young-sik was up next, taking on top-ranked Fan Zhendong. The 26-year-old trailed 5-3 to Fan in the first game, but he rallied with four points to take the lead. Fan later forced the game to a deuce by collecting three points in a row, but Jeoung bagged two consecutive points to take the opening set 12-10. But Jeoung couldn't hold the momentum. He lost two straight games to Fan, both by a score of 11-8, and gave up the fourth game 11-7. In the third match, Jang Woo-jin faced Wang Chuqin and the two players went deuce in their opening game. But it was the 18-year-old Chinese who smiled in the end with a 13-11 score. Jang rebounded in the next game by winning 11-7. He went neck-and-neck with Wang in third game, but lost 11-9. Jang seemed to run out of gas in the fourth game, trailing by as many as four points behind Wang. At 10-6, Jang gave up the match point by sending his forehand too far. South Korean coach Kim Taek-soo admitted China is still a "big wall" for his athletes to overcome. "We prepared well for this match, but apparently, Chinese players were better prepared," he said. "It's not that we played badly. China just played better than us. But since our players are growing, I think we'll have more opportunities to play against them in the future." Kim lamented that his players were physically tired from their tight schedule, but vowed that they'll recover for singles and doubles events.